In the wake of Kharif, the fake cotton seeds are disturbed by poor farmers. The fake beety cotton seed is rising as the kharif season cools. Recently, 60 packets of fake seed packets were seized in the Emigranaru zone. 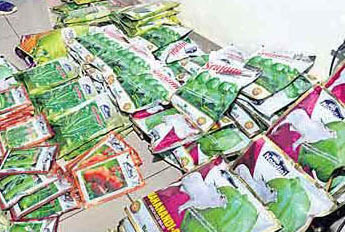 Four quintals of fake seeds were seized by the authorities in the latest Pathikonda mandalam. It is also concerned that the counterfeits of the Guntur and Ongole districts are not only in the district but also in the packing of the names of the so-called companies and their seed varieties. The farmers lost their crop due to fracturing of plants due to the lack of coating. In Pathikonda, Aluru, Adoni, Eminganur and Kurnool constituencies, crops in nearly 5,000 hectares are damaged. Some of the TDP leaders are active in this fake business. Last year, the crop yields were promising, the fall in the pink colostrum. The prices are also much better, as this year's cotton is likely to be huge. The district administration estimated that cotton cultivation would be 2.05 lakh hectares. The government has allocated 10.15 lakh bottle seeds of various companies to the district. But there are still no bottle seed packets. . Almost every village in the Adoni division along with the Kurnool subdivision is facing criticism for fake seed traders. Farmers can sell and sell their own. But some Akkars are collecting and processing the seeds from cotton ginning mills and it is packaged and packaged with beati-2 names. Fake beet seeds are also being transported to other districts through transport companies. The farm department and the vigilance officers are not focusing on fake sowing. In January last year, the fake seeds of fake beeti seeds were seized by fake seeds. This time the checks are short.